What is here called prayer is actually a song or a psalm. To put it in another way, it is a rejoicing. It is a prayer alright, as verse 1 says ‘And Hannah Prayed’. But it is a different kind of prayer from most of our prayer. Usually when we think of the word ‘prayer’, we think of us coming before God to bring a need, to petition. But for Hannah this prayer is actually a praise, a song, a rejoicing over God. When I read this portion of scripture last Wednesday, I was kind of excited because I knew it was a sermon that I wanted to preach. Pastor Lily was supposed to share today but I asked to share because I am excited over this sermon. Why am I excited? I am excited because it is an opportunity for me to sing, praise and rejoice over God. Hannah was rejoicing over God because God had given her the gift of a son. I Samuel 2 was the climax of her worship upon the occasion of the birth of Samuel. The period until the birth of the son had built up a crescendo that was manifested in this high point or peak that Hannah cannot but blurted out her rejoicing. Her return of praise to God was out of the abundance of a heart deeply affected by God’s goodness. God had been so good to her that this song, praise, psalms or rejoicing had to come out of her being. 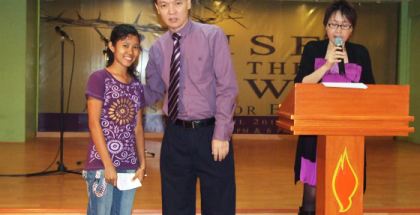 I was rejoicing too because I saw God’s hand over Pastor Lily and my life in the past 2 weeks. I was kind of excited for this sermon because I have an opportunity to praise God and rejoice over Him. This rejoicing has to be spoken aloud because it brings together thoughts and feelings about God. Hannah’s prayer of thanksgiving was also prophetic as she mentioned the Messiah. I dare to say that the more we praise God, the more our praise becomes prophetic. Hannah’s rejoicing was dictated not only by the spirit of prayer but by the spirit of prophecy. This rejoicing matched the mood and circumstances of Hannah of what she had gone through. Therefore it isn’t difficult to imagine her singing, praising with great feeling. What was the cause of this rejoicing? (1) She celebrated God’s deliverance and gift of a son. I Samuel 2:5 says ‘Even the barren has borne seven, and she who has many children has become feeble.’ This is definitely prophetic because later we know that Hannah had 3 more sons and 2 daughters. To understand Hannah’s celebration we need to know what she had gone through. Her husband had two wives. Peninnah, her husband’s other wife had children. I guess it was a lot of children because the bible mentioned Peninnah’s children in 1 Samuel 1:4 as ‘all her sons and her daughters’. But Hannah had no children. To make matter worse, Peninnah provoked her sore. Peninnah’s abuse and taunt had affected her. The bible says Hannah was in bitterness of soul, and she told God to look on her affliction and to remember her. She was of a sorrowful spirit and constantly she poured out her soul to God. Actually there were times it was out of the abundance of complaint and grief that she spoke to God. So when God gave her a son, it brought forth celebration and rejoicing. Have you gone through period where you receive abuse and taunt from people that really made you in bitterness of soul, in sorrowful spirit and you wait for God to look upon your affliction and to remember you? If you have, you can identify with Hannah. Peninnah represents your enemies, your evil neighbors. I was reading a book about my Mentor Minister LKY. He was very blunt and honest in his saying in this book. He told us Singaporean that we don’t have good neighbors. He even mentioned the neighbors by name; which is Malaysia and Indonesia. Singapore has a population of 5 million people today where Malaysia has over 20 million people and Indonesia has 250 million people. He pointed out that the previous President of Indonesia, Habibi said that Singapore is just a red dote on the map of the world and the 250 million people can just come and swarm over Singapore, and the island of Singapore will sink. He also mentioned that the former Prime Minister of Malaysia, Mahathir, wanted to cut off the water supply to Singapore (you know that without water any civilization will die), built another port in Johor to divert all ship calling at Singapore to dock instead at Johor (our economy depends on Singapore being one of the busiest port in the world), forbid us to reclaim land which is within our boundary rights. There was one time in 1993, on 9 August, 1993, which Singapore was celebrating its independence day, Malaysia and Indonesia conducted a large scale joint military exercise very close to Singapore to intimidate us that Singapore had to put its military on high alert when it was celebrating its independence day. LKY was telling Singaporean to wake up that our neighbors don’t like us, wish for our downfall and wants to destroy us if possible. Brothers and Sisters, there are Peninnah/neighbors in our life that don’t like us, doesn’t want us to succeed and wish for our doom. When I talked neighbors I am not just referring to neighbors literally but people close to you. They could even be your sisters, your supposedly friends, your colleagues and even sadly your Christian friends. As in countries so it is with people, especially when you are small and vulnerable and a threat to them. I want to point out the second part of verse 3 which says that ‘the LORD is a God of knowledge, and by Him actions are weighed. I was stricken by this verse because God told me that He knows what is happening around me. I told you last week that God works behind the scene. What you are going through, He knows and actions are weighed. God knows that Penninah was talking so exceeding proudly because she had children and Hannah had none. God knows that the arrogancy that came out of her mouth. Hannah was rejoicing over God’s way of justice. God weighs the deeds of man (what they did to you) and, if necessary, humbles and exalts the cry of a child of God. The proud and haughty will not stand. I believe that Penninah and her sons and daughters were very haughty too. I have gone through the abuses and taunts of others upon me. And I believe likewise many of you have gone through. I was reading Acts 15:24 and God talks about this people (the Peninnahs). Look how the Bible describes their taunts against us: ‘Forasmuch as we have heard, that certain which went out from us have troubled you with words, subverting your souls’. Oh there are people who literally troubled you with their words or say words against you. Subverting is a very strong word. It gives the idea of someone working behind the scene to destroy you. To subvert is to destroy completely; cause the downfall of you; hinder your normal daily lives. But thanks be to God who is working behind the scene for our good. I understand the feeling of Hannah. I understand your emotion and I feel the same sentiment myself. Of course, being put in that conditions, we could have cursed God, questioned his motives (whether he really cares for us), or rejected him (backslide, withdraw, become cold towards God) and lived from then onwards a miserable life of bitterness. That is the dangerous trap that many a good Christian has fallen into. I have read missionaries, ministers and sincere Christians no more serving God because of a Peninnah. Well the Bible says “woe to whom temptation comes.” But today God is telling us that we don’t have to react that way. God has knowledge of what is happening and all actions are weighed. God weighs the deeds of man and, if necessary, humbles them and exalts us. The proud and the haughty will not stand. God is aware of our thoughts and he judges our deeds. Wow! What a blessing to know that a comeback is being planned by God and the enemy has taken over will be retaken and God will then turn the tables around. Bible commentators describe I Samuel 2:4-8 as God in the business of reversing the fortune of the poor, to feed the hungry, to bring down the mighty, to transform the status of one’s life. Hannah described the areas of life where God proved Himself to be a great reverser of fortunes. How did he reverse it? There are five areas where God may prove Himself to be the great ‘reverser of fortunes’; might, famine, fertility, life and death, and economic status. In verse 4 God reversed the might. Verse 4 says ‘the bows of the mighty men (in this case it was Peninnah and her children) are broken and they that stumbled (that is Hannah) are girded with strength. In the first part of verse 5 God reversed famine; ‘They that were full have hired out themselves for bread and they that were hungry ceased.’ When God reversed fortune it could come to a point that the rich people with plenty of food would be looking for something to eat and would be willing to labor for it, while the poor, hungry people had more than they need. That is what verse 5 meant. In the second part of verse 5 God reversed fertility. Verse 5 says ‘the barren hath borne seven: (definitely it was prophetic for Hannah because at that time she only had one child, Samuel, and after this prophetic praise and rejoicing, she had 3 more sons and 2 daughters; and she that hath many children (Penninah) is waxed feeble. I personally believe that all the children of Hannah outshone Penninah’s children in the end. Verse 5 says Peninnah that had many children is waxed feeble (weak, pathetic). The best proof is Samuel who became the greatest prophet of his time. In verse 6 God reversed life and death, ‘The LORD killeth, and maketh alive: he bringeth down to the grave, and bringeth up. Was there a possibility that some of the children of Penninah were killed? I don’t know. But it is a fearful thing to fall into the hand of God. But God is in charge of life and death and everything in between. He can rescue us from the grave or permit us to die. If He allows us to live, He can make us rich or poor, exalted or abased. In Verse 7 and 8 God reversed our economic status. God can choose the poor and raise them up to sit among the princes. He takes them from the dust and the garbage heap and puts them on glorious thrones! Isn’t that what he did to Saul, David, Moses, the whole nations of Israel that were slaves? I believe one of the reasons why Hannah was so filled with rejoicing was because God silenced His people’s critics. So people had better be careful what they say and how they say it about God’s beloved. I had seen this happen before my eyes many times, when a certain Christian will say all the bad things about another Christians, to a point as if he is doomed. But then before my eyes I see God performing some miraculous deeds upon the supposedly doomed Christians that the mouth of the criticizing Christian is shut. I have also seen Christians make caustic comments about some believer’s children only to see them being magnified by God. God reverses fortunes. God provides for His people and God deals with His adversaries and exalts a person. Hannah’s song is a reminder of the believer’s need to come into God’s presence with praise and to celebrate how God deals with people and situations. All who feel weak and helpless in a world where it seems that the strong gets stronger, can find hope in the truth that God has a history of reversing circumstances that appear irreversible. It is in moments of worship that we are lifted high enough to see the final triumph of the people of God even in the midst of the most difficult and discouraging circumstances. Her eyes were open to see this God who aided her. She exalted in the LORD. Have you ever gone through some experiences in life and you come out of it just wanting to celebrate God? Hannah said in verse 1 that her mouth was enlarged. An ‘enlarged mouth’ means a mouth boasting of God’s victory over His enemies. Don Moen is famous for one of his beloved songs: ‘Celebrate Jesus Celebrate’. He says that Jesus is risen and he will reign forever more.’ I think Don Moen understood the true meaning of celebrating God. You also know that if you don’t celebrate God, it has become a sin. We have received mercy from God and therefore we owe it with thanksgiving. Praise is our rent, our tribute; we are unjust if we do not pay it. That is what I felt. After some magnificent deliverance, the Holy Spirit within me just wanted to celebrate God. Hannah also said ‘my horn is exalted’. The term “horn” symbolizes strength. Samuel was a gift from God. Samuel was not a product of her strength or her own achievement. In the LORD her strength was lifted up. She could boast over her enemies, but her boasting was in the deliverance of the LORD. She had a profound sense of God. There was no holy one like the LORD. There was none besides God. Ancient Canaan was full of idols. These small clay figurines were prayed to and worshiped with a hope that they could help. But Hannah did not pray to figurines; she prayed to the LORD. He was her rock and he had established her lineage. God has established Hannah’s lineage; her children, her posterity, her descendants, her heritage, her family. Like Abraham she started with no children but later God gave her children and established her inheritance. Pastor Lily called up Joy last night and told her the time has come for her to claim her inheritance which rightfully belongs to her. Today we have idols everywhere. We have images, grove, figurines, and statues. We have full of idols everywhere. But be like Hannah; do not pray to these figurines. Pray to God. Verse 2 also says that He is the Rock. The ‘Rock’ is one of the repeated images of the Lord. The rock speaks of the Lord’s strength, stability, and steadfastness and magnifies the fact that He does not change. Let Him be your rock and He will established your lineage. She celebrated God because God was a God of justice. Many times we asked ‘Is there justice in this world?’ Look at the Middle East today. They were ruled for 30 to 50 years under tyrannical monarch who kept the population poor but became so rich themselves because of oil. Hosni Mubarak is richer than Bill Gates. Libya President Gadaffi had rule for more than 50 years. Now God has decided to remove all of them. The revolution that is happening now has removed the Tunisian leaders, Egyptian leaders and right now Yemen, Bahrain and Libya is going through a revolution. Also God is preparing the king of the south that is represented by Egypt as its leader. God has prepared the King of the East represented by China and its hosts and now He is preparing the king of the South represented by Egypt and its hosts. But the most important truth is we should celebrate God because He is a God of justice. Hannah saw God’s justice prevailing because God had created and established the world. God is on the throne of life and his heart is with the poor and lowly. God chooses to work this way, and he did so in Hannah’s life. (4) She celebrated over her future hope. Verse 9 and 10 see Hannah’s rejoicing over her future. That hope was expressed in both temporal and mundane world as well as the eternal world to come. Your future hope includes your earthly, secular activities and the ordinary, routine and even boring world you live in. Travel in the ancient world was accomplished mostly by foot over difficult and rocky trails. Hannah proclaimed that the LORD will guard the feet of those who are faithful to him. It reminds me of how the sandals of the Israelites were never worn out in the 40 years of wilderness. There is just one word for it- Faithfulness. Also God will guard the feet of all those who are faithful to him. Brothers and Sisters, this morning I want to encourage you to be faithful to him. Be faithful in observing the Lord’s Day. There should be no other activities on Sunday until you have come to church. When you wake up on the Sunday morning, your first thought is, “I have to prepare myself to come to church.” Be faithful in paying your tithes and offering. Don’t argue with God in tithes and offering. I also learn about tithing and offering in the hard way. I don’t see my salary. Pastor Lily handles the family finances. And I am very grateful to her for putting the tithes as the top of her priority when it comes to expenses. Before anything is spent on our salary, money is set aside for tithes. She also taught my children well. Jan just received her first salary. It was quite a big amount of money for 13 days of work. It is close to Php 30,000. 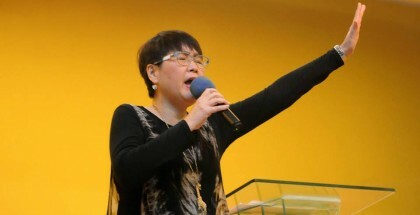 But it never occurred in her mind that said, “It is so much and I am tempted.” No, it was her first fruit (her first salary in her working life) and all the money goes to Pastor Dale or the church in Singapore. There are a number of you that pays your first fruits by giving all your first salary and I see God blessing you. Well when I was in Singapore last November, I had to be in charge of finances. To be honest I was haphazard and careless and I did not set aside my tithes to God. Yes I gave to God but honestly I didn’t know whether it was the full tithes. There was one time Jan chided me and said I must set aside money for tithes. Hey even though I am a pastor, God also dealt with me as a pastor. Let me tell you what happened to me. A lot of money passed through my hand and a lot of money disappeared too. I didn’t know where all the money went to. It came to a point that the money was depleting so fast that I became worried because I didn’t think I had enough to go through my stay in Singapore. I was lacking in finances and the Holy Spirit told me that it was because I did not set aside my money for tithes. So be faithful in tithing and offering. Tithing is faithfulness to God. Be faithful in walking in the commandment of God. Abstain from immorality and fornication. Abstain from worshipping idols. Let not your walk in life be unclean and ungodly. Pastor Lily always tells Joy and Jan that they are Levites. If they want to enjoy the inheritance that rightfully belongs to them because of their parent’s service to God, they have to live like the Levites. One of the requirements of Levites, especially the priest is to abstain from strong drink. God knows how to deal with my children. One day she woke up with a swollen eye. She had one big eye and one small eye. It was so embarrassing that she had to take medical leave for 2 days. I prayed for her but to no avail. Then I found out from Pastor Lily, which was kept a secret from me, that she went to her friend’s house and took some sip of cocktail with liquor in it. She argued that medically it is proven (that is how my children argue with us nowadays) her swollen eye has nothing to do with those sip of liquored cocktail. I called her up and challenged her and said ‘Ok, I challenge you to go and take the strong drink again.’ She shut up because she was afraid of the dealing of God. Be faithful in a clean life and a life that pleases God. Be faithful in prayer and reading of the book. The reason for Hannah’s rejoicing in 1 Samuel chapter 2 was because of 1 Samuel chapter 1 in which she prayed. One of the great different between you and the person outside of this church is that you as a believer have a prayer-hearing and prayer answering God. In the Old Testament during a contest with Elijah, the priests of the idols make desperate efforts to speak with their god by crying out and even cutting themselves, but to no avail. These idols have no voice, nor any that answer. How different from this is our prayer because verily God has heard and attended to the voice of our prayer as Psalms 66:19 says. What I am trying to say to you is that you as a believer have a prayer hearing and prayer answering God, whereas the people outside of this church can make desperate efforts to speak to their gods of idols but it will be to no avail. So be faithful in prayer. Because there are great rewards in your faithfulness. The Lord will guard the feet of those who are faithful. There is a future for those who are faithful. God will be faithful to your earthly, secular activities and the ordinary, routine and even boring world you live in. The wicked, however will perish. No one will be able to succeed by their own strength, and anyone who tries to oppose God in their ways (like the Lord’s Day, tithing, and holy life) will lose. Ultimately the LORD will judge the ends of the earth. In her closeness to the Lord, Hannah caught a prophetic glimpse of the coming Messiah, the exalted King who will be the judge of all the earth. Through the Lord’s anointed, true justice will reign on the earth and throughout eternity. By the power of the Holy Spirit, Hannah could see in her own experience the way the LORD would provide for the consummation of His kingdom. So let’s rejoice over our God because He delivers us and He reverses our bad fortunes. Above all, let’s rejoice simply because He is God and there is hope for our future. 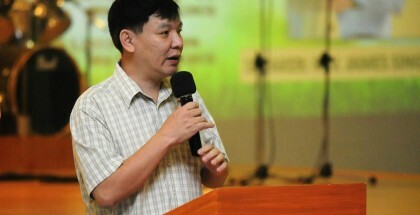 Sermon of Pastor Toh Nee.